The Sitting Volleyball Experience | A day of firsts! 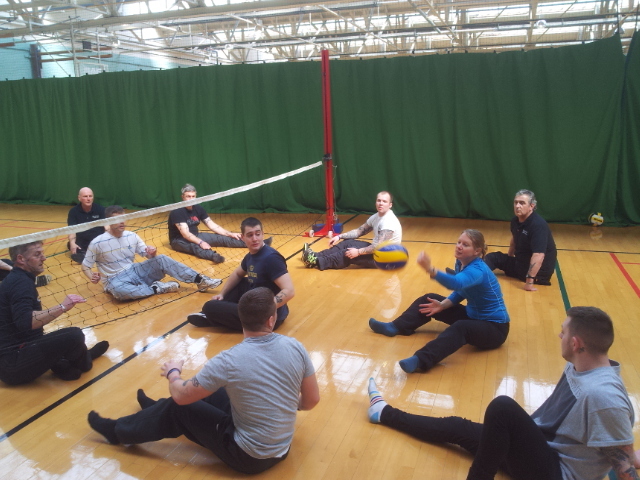 I delivered the first session for the Sitting Volleyball Experience today with wounded, injured and sick service personnel who are spending the week at the Battle Back Recovery Centre at Lilleshall. The session gave participants with a range of injuries the chance to try sitting volleyball, firstly through some team challenges and then playing a game. One group managed to reach 200 touches when working together to keep the ball off the ground, a very impressive total! The games were very competitive and everyone had great fun. 2 participants learnt how to referee and score while the others played. Initially the play was pretty random but throughout the afternoon, the teams began to work together more and play with more structure. One team even created there own labels for the dig, set, spike sequence – ‘1, 2, boom’! Looking forward to plenty more sessions! Where are you able to travel, how many in a group and how much will it cost?